Aggressive periodontitis is a rare form of periodontitis characterized by an early age of manifestation and severe destruction of the periodontal tissues. The disease manifests in two forms – localized aggressive periodontitis and generalized aggressive periodontitis (GAP) based on the clinical and laboratory features. In some cases, self-arresting disease progression. Poor serum antibody response to infecting agents. Most of the cases of GAP present with severe clinical attachment loss and bleeding on probing. Gingival enlargement and abscess although may be associated with GAP are rare. 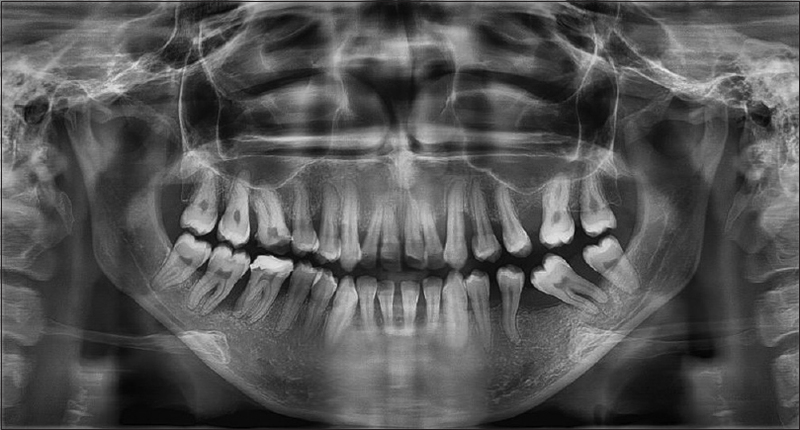 Although aggressive periodontitis has been the focus of many investigations aimed at understanding its etiopathogenesis, literature is deficient when it comes to assess the systemic manifestations of GAP. 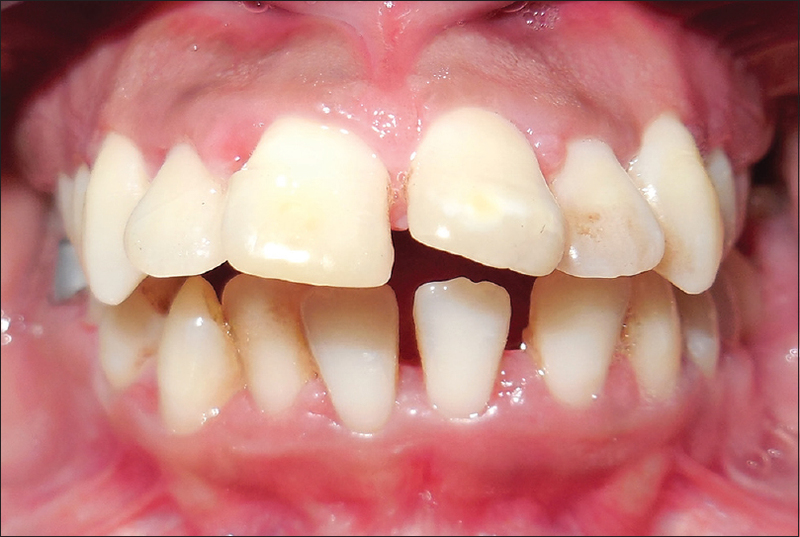 The present case report describes the first-ever reported case of GAP possibly associated with generalized gingival enlargement, multiple periodontal abscesses with dimorphic anemia, and mental depression as systemic manifestations. A 21-year-old girl reported to the hospital along with her father with a chief complaint of enlarged gums and early loss of lower 1st molar along with pus discharge from various sites in the oral cavity [Figure 1]. Detailed history of the patient revealed that enlargement and pus discharge started when the girl was 15 years and was preceded by mobility of her teeth. It was also revealed that the girl left her school at the age of 17 years as she was not able to catch up with her peer group in her studies although she was normal but slightly sluggish in her other day-to-day activities. One peculiar finding which was reported was that the girl lacked the desire to eat. Her father reported that the girl was not able to eat properly as she had mobile teeth and pain in her gums. On examination, the girl looked absolutely normal except that she looked slightly younger than her reported age and had a pale appearance. To rule out any psychiatric abnormality, consultation was taken from the Department of Psychiatry. They diagnosed the patient with borderline mental depression based on Hamilton Depression Rating Scale but suggested no treatment other than counseling (i.e., cognitive behavioral therapy [CBT]). CBT is in fact an established treatment, and majority of the cases of mental depression responded well to the same even in the absence of any antidepressant. 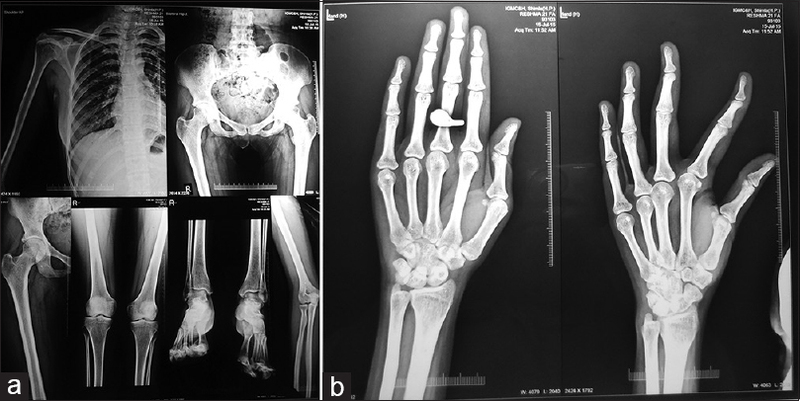 Also to rule out possibility of any syndrome and variation in her skeletal and mental age, full body radiographs of her right hand and wrist, right shoulder, right hip joint, right pelvis, right ankle, right elbow, and right knee were advised by her physician and the findings were negative [Figure 2]. A complete blood count was advised which revealed reduced hemoglobin. The red blood cells which showed the presence of mild anisocytosis, normocytes, microcytes, pencil cells, hypochromia, and occasional polychromatic macrocytes were also seen. Hence, the patient was diagnosed with dimorphic anemia with neutrophilia. Diffused gingival enlargement was present with superimposed gingival inflammation, and multiple sites with periodontal abscesses were also noticed in the region of upper canines and lower molars. Increased probing pocket depths and moderate-to-severe clinical attachment loss with vertical bone defects were present throughout the oral cavity at various sites [Table 1]. A peculiar finding was that in addition to the involvement of mandibular 1st molars and incisors, there was a severe loss of attachment and vertical bone defects in relation to various maxillary and mandibular teeth [Figure 3]. The amounts of microbial deposits were inconsistent with the severity of periodontal tissue destruction. There was also pathological mesial migration of mandibular left 2nd molar. A few carious teeth were also present. On microbiological investigation, it was revealed that there were elevated proportions of Aa but the Aa antibody titers were found to be normal. Based on the patient's history, general physical and oral examination, a diagnosis of GAP associated with pubertal gingival enlargement and periodontal abscesses was made, with mental depression and dimorphic anemia as the systemic manifestations of GAP. A detailed treatment plan was made which included restoration of carious teeth, treatment of periodontal abscesses, and thorough supra- and subgingival scaling. An orthodontic consultation was also advised to restore the deranged occlusion. It was advised to undertake orthodontic therapy after the periodontal condition of the patient was stabilized. The patient and her father were given detailed oral hygiene instructions and were motivated for better plaque control. Chlorhexidine digluconate mouthwash (0.12%) was prescribed to further aid in plaque control. Systemic antibiotics (amoxicillin and metronidazole, 250 mg of each thrice daily) were prescribed for 8 days. After the initial periodontal treatment which consisted of regular recalls every alternate day for the 1st week, the patient was recalled after 2 weeks for evaluation of the response to treatment. A re-evaluation at 3rd week from the initial periodontal therapy showed a reduction in probing depths and absence of gingival abscesses and no bleeding on probing. There was marked improvement in patient's mental status and hematological reports. Since the patient was improving and showing signs of gain in clinical attachment levels [Table 2] and [Figure 4] and her father was inclined to avoid periodontal surgery, she was put on supportive periodontal therapy and was advised to recall every month for the next 6 months. The present case report is the first-ever clinical evidence which describes a case of GAP associated with gingival enlargement and multiple gingival abscesses resulting in dimorphic anemia and mental depression. GAP is characterized by generalized interproximal attachment loss affecting at least three permanent teeth other than first molars and incisors. The diagnosis of GAP is made on the basis of clinical examination, radiographic and microbiological evaluation, and the historical evidence being provided by the patient. However, it is not necessary for the presence of all the above-mentioned factors to assign a diagnosis of GAP. In our case, two of the primary diagnostic clinical features were present along with increased number of Aa. Anemia is a condition in which the number of red blood cells (and consequently their oxygen-carrying capacity) is insufficient to meet the body's physiologic needs. In dimorphic anemia, two distinct forms of red cell populations exist. It can occur when iron deficiency anemia responds to iron therapy, after the transfusion of normal blood to a patient with a hypochromic anemia and in sideroblastic anemia. It shows signs of folic acid deficiency and severe iron deficiency anemia. One of the most astonishing findings in the present case was the fact that the patient was diagnosed with dimorphic anemia based on her hematological reports. The cause of anemia could be GAP in this case as the patient was not able to eat properly for the past 1 year due to pain and discomfort caused by severe periodontal destruction. In addition, the patient's lack of desire to eat due to mental depression could have contributed to the loss of appetite and reduced hemoglobin levels. 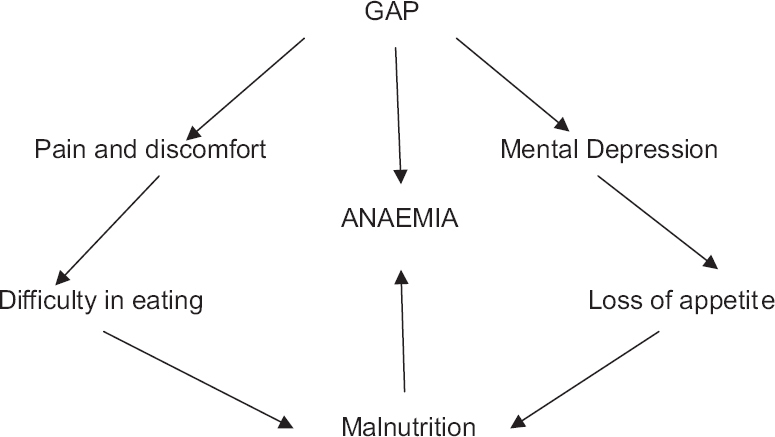 An interesting correlation could be established between GAP, mental depression, and anemia in the form that GAP resulted in depression and malnutrition and depression further contributed to lack of desire to eat and hence anemia [Figure 5]. Previous studies have in fact suggested that GAP leads to mental depression, weight loss, malaise, and loss of appetite. The fact that there was a significant improvement in patients' blood picture which correlated with the improvement in her periodontal condition again supports the diagnosis of dimorphic anemia as a consequence of GAP. The incidence of anemia as a consequence of chronic periodontitis cases has also been reported earlier., The difference between anemia caused by chronic periodontitis and GAP lies in the fact that while chronic periodontitis results in anemia of chronic diseases with normal mean red cell volume (MCV) values and reduced hematocrit,,, the anemia caused by GAP is of dimorphic type and nutritional deficiency related with normal red blood cell count and altered MCV values. Although a polymerase chain reaction (PCR) analysis for confirming genetic aspect and neutrophilic activity would have definitely helped but as the patient was poor and in majority of the cases of GAP, the diagnosis is made according to the criteria set by the American Academy of periodontology, 1999 classification of periodontal diseases and conditions (i.e., using history, clinical features, and radiographic features aided by microbial examination if needed. Family history may reveal a history of early tooth loss in the parents or immediate blood relatives of the patient); these were not recommended. In addition, the utility of PCR is limited as it adds immensely to the cost of treatment for the patient. The enormous cost of the very accurate PCR technique is deterrent to its widespread application in routine diagnostic procedures. After a period of 6 months, there was a significant improvement in the patient's condition although a dietary supplement containing iron and folic acid and other trace elements was prescribed in consultation with her physician for a period of 3 months as a part of maintenance therapy. Majority of the literature on GAP is available in the forms of case reports and case series due to difficulties in gathering sufficiently large populations to assess the diagnostic features, pathogenesis, and systemic effects of the condition. The literature is scarcer for assessing the systemic effects of GAP. In addition, as most of the current reported evidence is focused on the etiopathogenesis of GAP and its treatment, the systemic manifestations of GAP are often neglected. Hence, our case report underscores the fact that GAP may result in dimorphic anemia, other nutritional deficiencies, and mental depression. It is recommended that the clinicians must assess these systemic manifestations while preparing their treatment plan for GAP. Dimorphic anemia and mental depression are possible systemic manifestations of GAP. The treatment regimen for GAP must take into account the associated systemic manifestations of GAP, and nutritional supplements may also be added during the course of treatment to improve the patient's condition. The possibility of patient having mental depression along with GAP should also be taken into account and dealt accordingly. It is also worth mentioning that as this was a case report of a single patient, it is not possible to establish/rule out a cause and effect relation between GAP and the two conditions until future studies on a larger group of population are performed. Lang N, Bartold PM, Cullinam M, Jeffcoat M, Mombelli A, Murakami S, et al. International classification workshop consensus report: Aggressive periodontitis. Ann Periodontol 1999;4:53. Tonetti MS, Mombelli A. Early-onset periodontitis. Ann Periodontol 1999;4:39-53. Padmanabhan S, Dwarakanath CD. 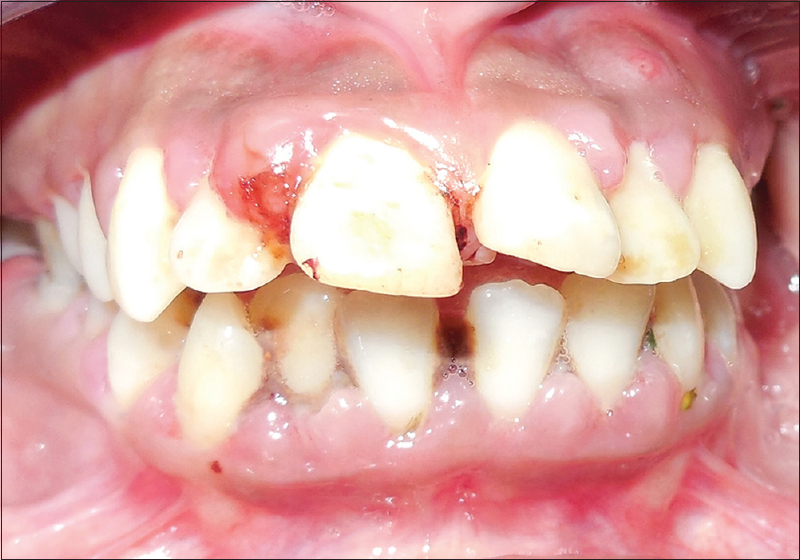 Severe gingival enlargement associated with aggressive periodontitis. J Indian Soc Periodontol 2013;17:115-9. Mahajan A, Dixit J, Verma U. An intriguing case of gingival enlargement associated with generalized aggressive periodontitis. Periodontal Pract Today 2007;4:295-9. Carranza FA, Hogon EL. Gingival enlargement. In: Newman MG, Takei H, Klokkevold P, Carranza FA, editors. Carranza's Clinical Periodontology. 10th ed. St. Louis, MO: Saunders Elsevier; 2006. p. 374-88. Singh AK, Saxena A. The periodontal abscess: A review. J Dent Med Sci 2015;14:81-6. Roshna T, Nandakumar K. Generalized aggressive periodontitis and its treatment options: Case reports and review of the literature. Case Rep Med 2012;2012:535321. Page RC, Altman LC, Ebersole JL, Vandesteen GE, Dahlberg WH, Williams BL, et al. Rapidly progressive periodontitis. A distinct clinical condition. J Periodontol 1983;54:197-209. Gross RL, Reid JV, Newberne PM, Burgess B, Marston R, Hift W, et al. Depressed cell-mediated immunity in megaloblastic anemia due to folic acid deficiency. Am J Clin Nutr 1975;28:225-32. Bain BJ. Blood cell morphology in health & disease. In: Lewis SM, Bain BJ, Imelda Bates. Dacie & Lewis Practical haematology. 10th ed. Philadelphia: Churchill Livingstone; 2006. p. 79-113. Velez H, Restrepo A, Vitale JJ, Hellerstein EE. Folic acid deficiency secondary to iron deficiency in man. Remission with iron therapy and a diet low in folic acid. Am J Clin Nutr 1966;19:27-36. Pradeep AR, Anuj S. Anemia of chronic disease and chronic periodontitis: Does periodontal therapy have an effect on anemic status? J Periodontol 2011;82:388-94. Yu SL, Eng HL. Dramatic recovery from severe anaemia by resolution of severe periodontitis. J Dent Sci 2010;5:41-6. Hegde S, Riyas, Kashyap R, Kumar A. Comparative evaluation of blood parameters in chronic periodontitis patients and healthy patients for signs of anaemia. J Dent Med Sci 2014;13:30-6. Valones MA, Guimarães RL, Brandão LA, de Souza PR, de Albuquerque Tavares Carvalho A, Crovela S, et al. Principles and applications of polymerase chain reaction in medical diagnostic fields: A review. Braz J Microbiol 2009;40:1-1.